University Housing and the University Health Center (UHC) are excited to announce the latest product of their partnership: the Healthy at Home certificate. The certificate program is focused on addressing health and behavior-related issues that affect our residents. Throughout the academic year, six different types of programs will be offered to help our residents to be Healthy Dawgs. UHC staff will present ten programs in the residence halls on bystander intervention in August and September, seven programs on sexual health in September and October, and six programs on stress management in November and December. More programs will be scheduled for the spring semester. Participants will be awarded a certificate and coupon card for discounts on university products and services upon the completion of three of the annual six programs offered. 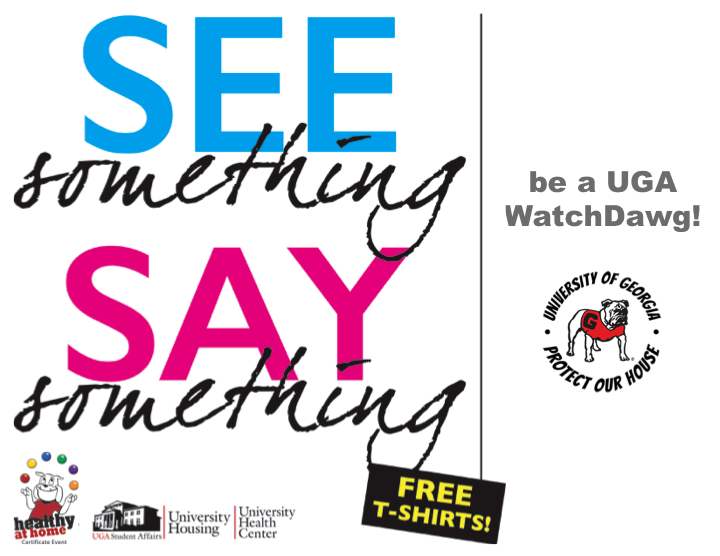 Why Does Bystander Intervention Matter? The bystander effect is a phenomenon in which the more people who witness an emergency event, the less likely anyone is to intervene. BUT, silence and passivity are not okay. They encourage attitudes and behaviors that promote and normalize sexual violence. Join the UGA community as we promote a campus where violence—in any form—is not tolerated and where doing nothing is no longer an option. More about the WatchDawgs program is available at the University Health Center’s website. Questions? Email housinguga@gmail.com. Each program will feature giveaways and refreshments!